WORK IN PROGRESS - Please understand that we are actively rewriting much of our documentation and this page is currently "under construction"; if there's anything that you'd like to see added to and/or expanded upon, please let us know by sending us a smile. The Sales People window provides the tools necessary to manage the sales people that you will use when working with Customers, Contracts, etc. It can be found in Settings which is accessible from the Dashboard. New: Creates a new entry. Open: Opens the currently highlighted entry. Print: Prints the visible list, as it is currently design/visible. Print Preview: Similar to Print, but displays a Preview window prior to printing. Close: This closes the window. Archive: Checkmark on/off to show Archive. Trash: Checkmark on/off to show Trash. Merge: Merge one conflict into another and delete that conflict. Reset: Reset the window and columns. Refresh: (F5) Reloads the page. Opens the currently highlighted entry. Initiates the process of creating a new entry. Merge - Merges two conflicts...See below. Archive -Places that conflict in Archived. Trash - Places that conflict in trashed. Merge will move all allocated areas assigned from the original revenue source to the merged one, you assign it to, and then delete the original revenue source selected. Multi-Select allows you to Shift/Left click or ctrl/left click to gather a few salespeople/users and right click to open the Context menu and apply to all highlighted. The New button initiates the process of creating a new entry. Enter: Open the highlighted entry. Ins: Initiates the process of creating a new entry. CTRL+F: Accesses the Find window. Home: Moves the highlight to the top of the list. End: Move the highlight to the bottom of the list. You have seen where Sales people are already in Customers, Contracts, They are a standard column in a few reports and some reports have the ability to add a Sales Person column to the report. 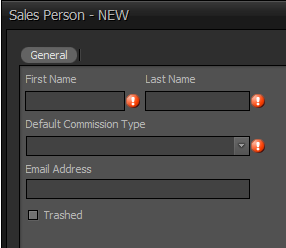 Shows the commission types setup up by the administrator. See Commissions. The email address for this salesperson. This box allows you to toggle the Trashed status for salesperson. When trashed, this salesperson is no longer available in the list of sales people when working with Customers and Contracts.